A multicut system can provide energy and protein at significantly lower cost than buying in. However, many farmers adopting this system encounter rumen health issues, resulting in loose dung, low butter fats and loss of BCS – and lost potential. The problems occur due to insufficient forage fibre (slow pool NDF) in the diet. NIS is a digestible, palatable, easy to feed forage fibre. Many UK and Irish farms are improving the rumen utilisation of low fibre silages (and grazing) by monitoring the dung on a daily basis and altering NIS feed rate to suit. 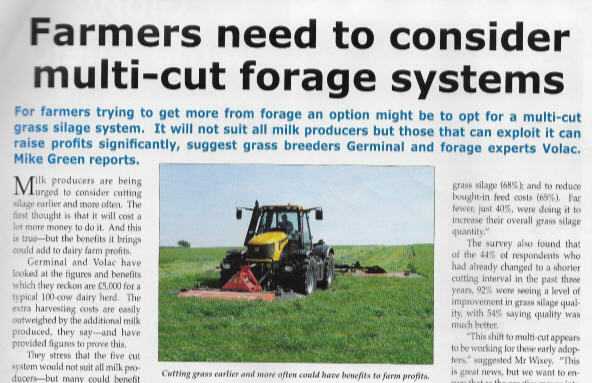 The result is increased dry matter intake, increased butter fat content at same milk yield, healthy happy cows and more milk solids from home grown forages.